ST. GEORGE – Police took a Parowan man into custody Tuesday after he allegedly beat his wife and threatened to kill her. 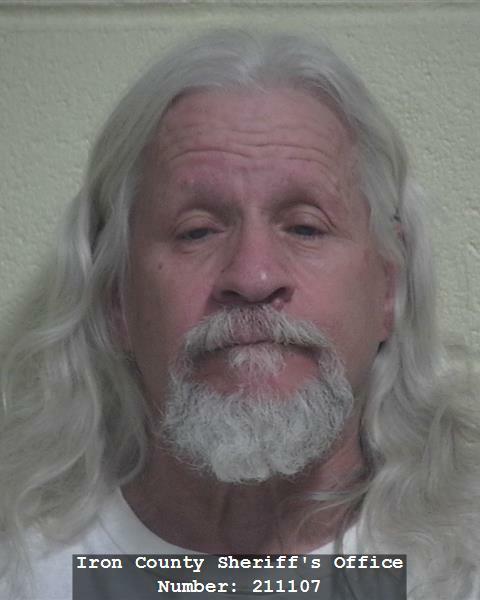 Police responded to a weapons offense at the home of 64-year-old George Henry Strain in Parowan, according to the probable cause statement. Strain’s wife told police her husband had hit her repeatedly with a knife and was threatening her with it. He also told her he was going to kill her. As Strain’s wife attempted to get away from him, he hit her head into a door, according to the statement. The woman called for help and her son responded and he was able to get her away from Strain. He and other witnesses told police they had seen Strain with a knife in his hand as he attacked the woman. Because Strain told police that he would “get on a Greyhound Bus and never come back,” the responding officer classified him as a possible risk to others in the community, as well as a flight risk. Strain was booked into the Iron County Correctional Facility and charged with a third-degree felony for aggravated assault and misdemeanors for the intentional abuse or neglect of a vulnerable adult and intoxication. Bail has been set at $15,000 according to court records. Though Strain used a knife during the assault, the police report did not go into any detail concerning possible injuries the woman may have received during the assault. Just when you think you have heard of the most depraved human being, someone like this neanderthal has to demonstrate that you can still harm people even without an active cranium.